LADIES, PLEASE BEWARE! ARMED ROBBERY AT TAMPINES!! 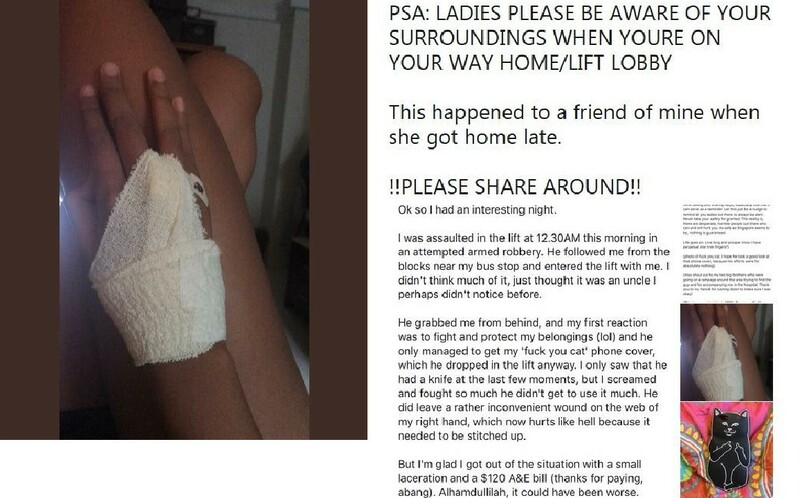 You are at:Home»Caught In The Act»LADIES, PLEASE BEWARE! ARMED ROBBERY AT TAMPINES!! This happened to a friend of mine when she got home late. ! !PLEASE SHARE AROUND!! Ok so I had an interesting night. I was assaulted in the lift at 12.30AM this morning in an attempted armed robbery. He followed me from the blocks near my bus stop and entered the lift with me. I didn’t think much of it, just thought it was an uncle I perhaps didn’t notice before. He grabbed me from behind, and my first reaction was to fight and protect , belongings (lol) and he only managed to get my ‘f**k you cat’ phone cover, which he dropped in the lift anyway. I only saw that he had a knife at the last few moments, but I screamed and fought so much he didn’t get to use it much. He did leave a rather inconvenient wound on the web of my right hand, which now hurts like hell because it needed to be stitched up. But I’m glad I got out of the situation with a small laceration and a $120 A8. bill (thanks for paying, abang). Alhamdullilah, it could have been worse. Next Article MAN CAUGHT URINATING AT HDB VOID DECK!